The Inland Empire SHRM chapter has been helping HR professionals prepare for and pass certification exams for years. We encourage professional certification for those interested in growing their HR careers and expanding their knowledge. We offer Certification Preparation Classes for both PHR/SPHR (HRCI) and SHRM-CP/SHRM-SCP (SHRM) so you can choose the certification that’s best for you. IE SHRM Certification Preparation Classes are offered on Saturdays to accommodate your busy schedule. Take your career to the next level…Get Certified! Organizations registering 3 or more individuals will receive a 15% discount. Richard Dawson, SHRM-SCP, SPHR, PHRca, HRPM, sHRBP, is an experienced, tactical, strategic HR manager. He is also certified in Federal and California employment laws and certified in CUE, Labor/Employee Relations. Richard has industry acumen, experience in training and development, organizational effectiveness, talent management and full-cycle human resources. Richard is an experienced Certification Preparation Class Facilitator, teaching the PHR/SPHR and SHRM CP/SCP classes to HR professionals across the Inland Empire, Los Angeles and Orange County. Richard believes that his greatest role is paying it forward, by assisting others with their success. Do you want a chance to receive a Certification Prep Class Scholarship? Now is your chance! Inland Empire SHRM offers scholarships for our Certification Prep Classes. Designated IE SHRM chapter members are eligible to apply. In 2019, we will be awarding four (4) Certification Prep Class Scholarships, each valued at $1,195. Two will be awarded in June and two will be awarded at our annual HR conference in October. Inland Empire SHRM will cover the cost of class registration and materials. Award winners are responsible for actual exam cost(s). 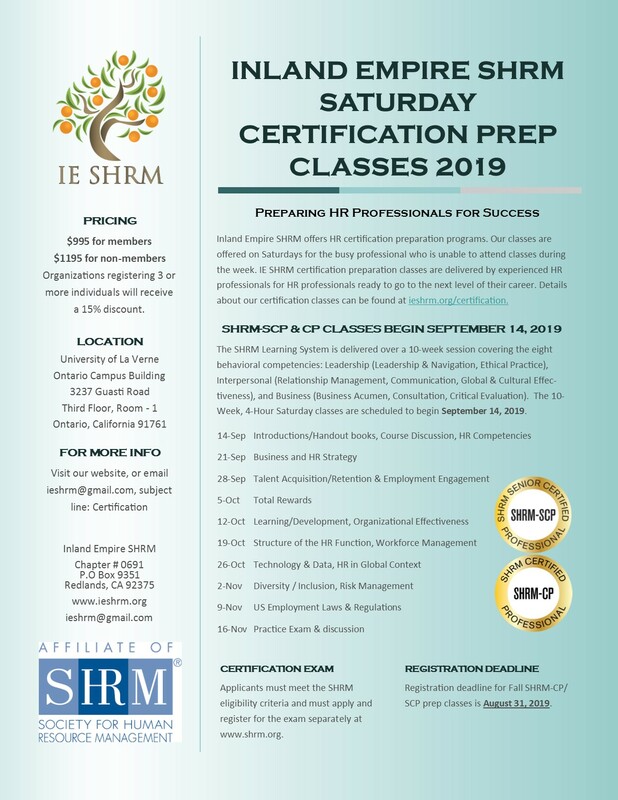 Certification Prep Class Scholarship award winners must register for one of the two Certification Prep Class programs offered by IE SHRM within one year of the award date. Complete a Certification Scholarship Application, or send your completed application via email to ieshrm@gmail.com with subject line "Certification Scholarship." Let us know why you should be awarded a Certification Prep Class Scholarship. The deadline for June 2019 scholarship awards is April 30, 2019. Scholarship award winners will be informed of their award by email. The deadline for the October 2019 scholarship award is October 17, 2019. Award winners will be announced at the annual conference. Upon review, the board of directors will select the two successful applicants for each scholarship period. Hi, my name is Luis and the following is what it took for me to pass the PHR in 2017 and what I will use to prepare for the SRHM-SCP for 2018. I was 25 and just completed my MBA from the University of Phoenix in March 2017 and immediately signed up for the PHR prep course. I started the prep course with 3 years of HR experience. On the first day of the prep course I met the instructor, Richard Dawson, I was immediately impressed with his credentials and his familiarity to speak on all HR functions. I listened intently, took notes, highlighted my books, circled and starred important topics. Everything in the prep books contained HR information that I never learned in my current job and quickly realized it would take serious determination to read, study and take practice test questions to receive certification. At the end of the prep course I signed up for the test so that I would force myself to continue to study, however, I did not feel ready to take the exam any time soon and luckily the test window became open for the full year. I was hired for a new HR position with a different employer but my new job came with increased responsibilities. I began working 10 to 12-hour days to fulfill my duties to my employer which left me little time to study. However, I still gave myself at least 1 hour every day to read, use flash cards, and pop quiz HR topics. On the weekends I would use Saturday to catch up for at least 6-8 hours and on Sunday review more flash cards. At that time, me and my girlfriend came to an agreement to set time to study our own respective courses and supported each other. This support was invaluable to know that I wasn’t the only one studying so intently. Life also threw me a curve ball and my grandpa had a stroke which made me want to be around family and help him recover. I now spent at least 1-2 days a week visiting my grandpa and the rest of the days at least 1 hour to study and still use my weekends to catch up. I ended up using a full 180 days to study and review for the PHR through constraints from work, family, and life. Ultimately, I took and passed the PHR on December 7th, 2017 with a big smile and a weight off my shoulders. With my new certification I began looking for other opportunities. By January 2018 I attained my dream employment opportunity and it was a direct result of my certification, education, and determination to do what was necessary to pass. My only advice for anyone seeking to improve their HR knowledge or attain a better employment position would be that there will always be obstacles that impede your success but it takes the determination to at least make the time to study to invest in your own success. Studying the HR functions will expose you to areas of HR unknown which will improve your familiarity and attaining a certification will set you apart in the HR applicant pool. For me, the SHRM-SCP is next, whatever it takes. Thank you Richard. I am still in disbelief and still shaking. I will definitely be celebrating this evening. I want to thank you because I feel that you effectively helped me in knowing how to break down each and every question by honing in on key words and being able to eliminate unnecessary options. I think along with knowledge and experience without you teaching that technique I don't know if I would have been able to pass. So thank you. For me, I believe the book and repeatedly taking the online test in the SHRM learning system both CP and SCP helped me with the knowledge questions and honestly, I would have to say that my experience helped me answer the situational judgment questions. Being exposed to various management styles, industries, and cultures really helped me answer those questions. I did freak out once the time hit the 2 hour mark because I had only completed 106 questions and the situational judgment questions seemed to be ongoing and never ending. However, I completed the exam with an hour and 20 minutes left. I never flagged a question to go back and answer, I just went with my gut and answered the question and went to the next question. What I did use was the highlighter feature which helped me look at key words to answer the question. I must say, I am glad this adventure is over and I hope IE SHRM will take a chance on someone else by providing them with a full scholarship and see that its not in vain. Again, thank you for your effective teachings and tips as well as IE SHRM. I couldn't have done it without the support of you all. Getting your HR Certification is a personal choice that can have varying benefits depending on your level of experience and company that you choose to work for. Acquiring new skills and staying up to date on HR topics and practices can be advantageous, but will require long-term commitment. The following may help you decide whether certification is right for you. Will Certification Help You Get A Job? Having an HR certification will often help you to get a job in the field, no matter what industry or position you choose to pursue. Even if HR certification isn't listed as a requirement, having a certification may give you a leg up on other applicants and show the employer that you are dedicated. Invariably, having an HR certification looks better on your resume. HR certifications can help with job advancement and pay raises in much the same way they help new applicants to get a job; they improve the employer's perception of you. However, certifications can also help you to keep your knowledge and skills fresh and give you a boost of confidence in your competency. These factors are all conducive to promotions and raises and may be the final point in scoring a promotion over another candidate. There are two main organizations that offer HR certifications: the HR Certification Institute (HRCI) and the Society for Human Resource Management (SHRM.) The two companies split up in May 2014, which is when SHRM started offering the SHRM Certified Professional for new entrants into the field and the SHRM Senior Certified Professional with six or more years of experience. Both organizations are very respected by employers and HR professionals. Do I Have to Take a Class to Get an HR Certification? Certification Preparation Classes are not required to sit for the exam offered by SHRM or HRCI. 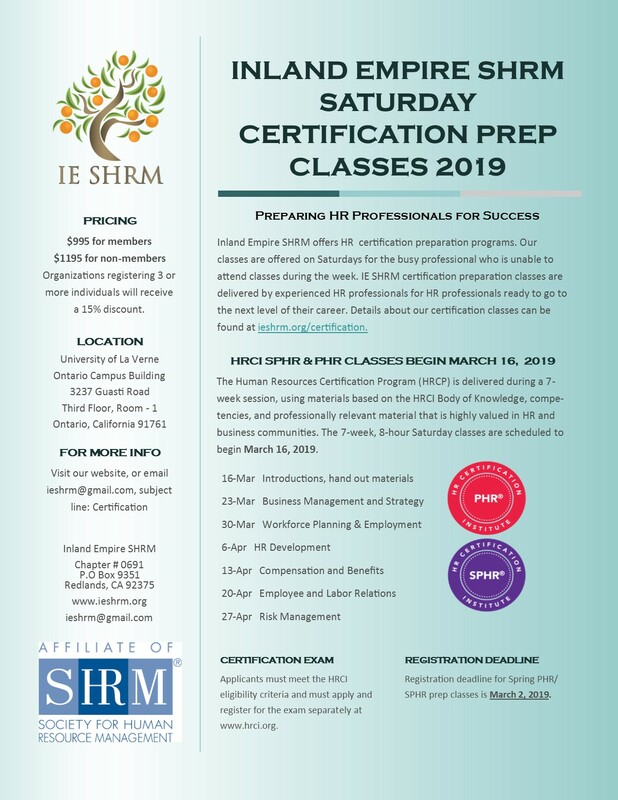 However, Inland Empire SHRM wants to increase your chance of success for passing the exam, so we encourage taking a prep class. Studies show that individuals that take the time to study and prepare for the exam seem to have a higher exam pass rate. Prep classes also give you the opportunity to meet other HR professionals with the same dedication to success. How Do You Get an HR Certification? To obtain the certification listed, you must pay exam fees and sometimes application fees. After the application has been accepted, eligibility requirements have been verified, and fees have been paid, you can schedule a time to take your exam at an approved testing center. Beware, however, that many do not pass their exams on their first try. How Do I Keep My Certification? Once you have successfully passed your certification exam, you will be required to maintain your awareness and understanding of HR topics and practices through continuing education. Your certification is valid for a three year period during which time you will need to attend conferences, workshops, seminars or programs offering HR re-certification credits to apply toward the renewal of your certification. Inland Empire SHRM offers one source of continuing education by offering re-certification credits for various programs. Other sources of continuing education are offered through HRCI and SHRM.